The Cuban Conure (Aratinga euops) is imperiled by human activity, the most serious being loss of habitat. Outcomes: The species is legally protected within seven environmental reserves, including the important Ciénaga de Zapata National Park (Snyder et al. 2000). Research on these parakeets, the addition of nest boxes and education of local people are aimed at helping to preserve populations. Ecotourism programs have been begun in some areas (Snyder et al. 2000). Where found: Found in Cuba and formerly Isla de la Juventud (Isle of Pines), West Indies. History: Cuban Conure (Aratinga euops) numbers have declined rapidly and this, along with a small and fragmented range and trapping for the bird trade, has put the species in jeopardy. (Collar et al. 1992). The total population is now thought to be no more than 5,000 individuals (A. Kirkconnell in litt. 2007). 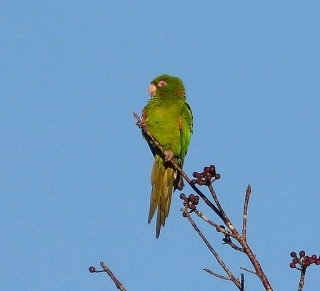 The Cuban Conure was formerly one of the most common endemic birds on Cuba, but is now rare throughout the island. It can still be found in a few of the more remote regions, such as the Zapata peninsula, the Trinidad Mountains and the Sierra de Najasa (Juniper and Parr 1998, Raffaele et al. 1998, Snyder et al. 2000). It may have disappeared from the western provinces (excluding Zapata) (Raffaele et al. 1998) and Isla de la Juventud, where it was once common. Recent studies of a total of 14 populations have found that four are in serious decline (Snyder et al. 2000). Ecology: The Cuban Conure is found in areas of savanna where Copernica and Thrinax palms occur, woodland edge and agriculture areas with trees. It feeds on fruits of mango, papaya, guava, Roystonea palms, Melicoccus bijugatus and Spondias luteus, and seeds of Inga vera, shoots, millet, berries and grass seeds. Birds are seen generally in family groups or small flocks but sometimes gather in larger congregations of several hundred, and will socialize with the Cuban Amazon.